By undertaking to educate every single American child all the way through high school, the United States has set for itself a goal unrivaled by any other country in the world. But this goal has run full tilt into a heated debate about what we teach diverse children about our history, language, and literature. Arguments for and against multicultural education, according to Judith Renyi, Director of Collaboratives for Humanities and Arts Teaching (CHART), have too often been debated in a historical vacuum. 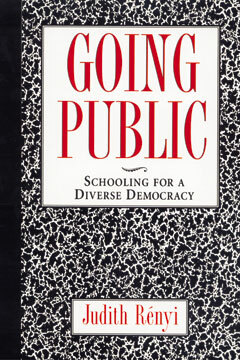 Going Public is an unprecedented attempt to provide the historical context of the struggle for diverse curricula in American public schools. It also interprets the teachings of our schools in surprising ways. With erudition and sensitivity—combined with firsthand knowledge from visits to hundreds of elementary and secondary school classrooms across the country—Renyi offers historical perspective as well as humane solutions. Judith Renyi is the executive director of the Mayor’s Commission on Literacy in Philadelphia.